For the context, here’s Part 1. So where does this leave us in practical terms this of gift-buying and more importantly, celebrating this Christmas this year? Well first a confession. As a parent of three kids 5 and under, toy shopping can be a lot of fun. Batman hoodies, Lego sets, princess stuff, man, it’s easy to get carried away and that’s just on Groupon. I’m not sure how helpful it is to use the gifts of the Magi to justifying our theology of shopping this Christmas season but gift-giving is part of our Christmas culture and I am not afraid to like this. Further, I like Santa, I like Elf, I like real Christmas trees, and holiday traditions (Really, how can you not like Elf?). Now, I’ll differ on the deeper-rooted message of many holiday movies. But they are only trying to make us laugh, not offer us meaning and purpose. I don’t like materialism, I don’t like consumerism and I don’t like idolatry but you can still have traditions and keep the meaning of Christmas central – it just takes effort. And I believe that you can have both. It’s like when people ask, can you really have a wedding reception with dancing and alcohol right after a sacred Christian ceremony? Yes, I think Jesus’s first miracle makes that clear. (I can hear my Baptist friend say, “Wait a minute, the Gospel of John doesn’t say anything about dancing.” Yeah, they were sitting around discussing the Pentateuch over wine and bread all week). I digress and we return to answer the question, “How then shall we shop?” Over the years, my family has taken different approaches of gift-buying. In childhood, there were years of buying something for everyone. We have a huge family and we found this to be crazy, overwhelming and distracting. Then there was the year we exchanged no gifts. I call that the year of “Two Easters” but really, it just felt like we were trying too hard to answer the gift-giving issue. Gift-giving at most family gatherings is the climactic moment of Christmas Day. For some of us as kids, it’s the time we finally get what we’ve wanted all year (I know I’m not supposed to say that but we know this right?). As we get older, this becomes less and less climactic because so many of our needs/wants are already satisfied so there’s no way this gift can be that fulfilling. Perhaps we can do better at framing that, more on that in a minute. Like many others, we’ve settled on a “one to one” exchange that is determined by names in a hat on Thanksgiving. We’ve even rigged it by providing options for each other so it’s not a waste of time/money and still have some surprise. This year, I am shopping for a 3 year old and honestly, I’m kinda excited about that. But why the need for gifts? If gift-giving can become indulgent and distracting does the removal of gift-giving become more worshipful and focused? I argue not necessarily. I know some who refuse to exchange, citing they prefer to give gifts at a different time of year. Well, on some level, I concede that’s their prerogative and someone like me requiring gift-giving is as ridiculous as you banning it. But if I may pursue this, I simply question if one is really less materialistic/consumeristic and able to grasp the beauty of Christmas because they choose to exchange in March or July rather than in December. To each their own, but I think some are missing out on the joy of gift-giving. Second and to sarcastically aim for the jugular here. You might recall that this didn’t work out for Frank Costanza (in one of the best Seinfeld episodes ever!) when George’s dad creates his own Christmas holiday “Festivus.” To cut to the chase, Frank teaches us that even in trying to solve the problems of Christmas, it’s just as easy to ruin it for the ones we love even more. We also learn that tradition can drain the life of something sacred but when committed and sacrificial people celebrate the meaning of the profound then it reclaims its sacred worth and we find that it’s worth doing every year in community. This is good tradition. It’s easy to go in the extreme other direction. Well, if some gift-giving is good, then let’s do it “more Christianly.” I know a pastor who says the most expensive gift to be given this year should be to Jesus. And by that, he means the offering at his church. How convenient. He teaches that if you buy your child an expensive toy, then your Christmas offering should be more than the cost of that toy. He goes further and suggests that perhaps you bought your spouse expensive jewelry, well then, you owe Jesus that much more! After all, you wouldn’t want to cheat the Christ-child! On one hand, he’s solved the plate full of dollar bill problem at the Christmas Eve services. But on the other, this opportunistic, guilt-charged plea cheapens the grace found in the Christmas story and attempts to make the offering a new idol. On another note, this is why I love that at our church Grace Chapel the entirety of the Christmas Eve offerings throughout all of our services will be donated. Our leadership has felt that it doesn’t feel right for visitors to contribute to our budget and perhaps there’s something better for all of us to give towards. Last year it was given to International Justice Mission to support their efforts in fighting human trafficking. This year it will go to the Philippines’ relief effort. I know people in this church who have told me, “That’s why I’m giving my wife a new ice-scraper for Christmas and giving her diamonds for New Year’s.” Now I don’t know how really damaging this is but it’s just silly. And not Elf silly, but worse, reality silly. Worse it’s legalistic and pushes people to create new technicalities, and this is typical whenever we overcomplicate gift-giving and celebrating Christmas. There are a thousand ways to ruin Christmas. We’ll never stop thinking of new ones. But here’s among the ways of how some of us have found to celebrate the richness of Jesus coming near. In the Christian tradition, gift-giving serves as both a symbol and reminder of what God does for us. Now, it’s hardly a substitute for the weeks of spiritual waiting and expectation of Advent and the worship found at most Christmas Eve services so I would advice against skipping all that and naïvely thinking exchanging a gift with a loved one will sufficient. Instead, it’s through Advent, through Christmas Eve worship, through the prayer and reading Scripture Christmas morning, after gathering with loved ones that we exchange our gifts. it’s in this context, when we frame that the contents of this wrapped box is a temporary, tangible expression of what God gives us in Jesus. Only with Jesus, the gift never breaks, and you have the choice to guard the joy He offers. So back to my Christmas gift to my 3 year old relative. If the beauty and joy of the Jesus birth narrative is thwarted by a Melissa and Doug princess set then we may be telling the story wrong. It’s not the gift-giving that ruins Christmas, it’s the lack of dwelling in the meaning of this holiday. But there’s yet another point that we would be remised not to mention. It seems timely that this post lands on St. Nicholas Day. 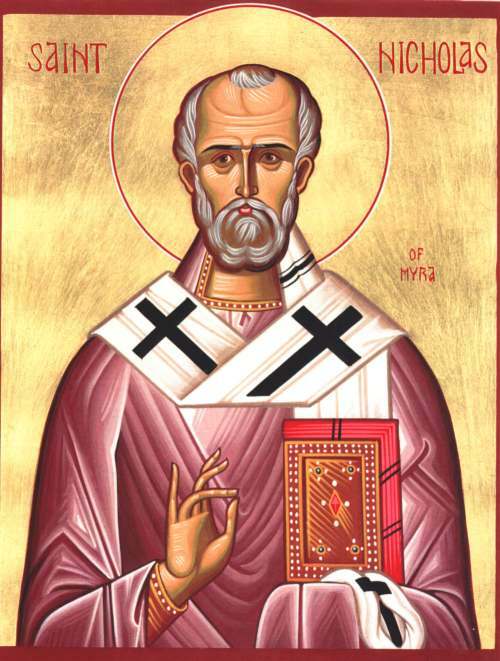 The real St. Nicholas of of Myra as you might remember, used his inheritance to assist the orphans and those in need throughout his community. He did many other things all throughout the year, and his death in the 4th century on December 6th reminds us that this is a special time of year for charitable giving. For us, the problem isn’t that we give to those in need at Christmastime, the problem is that some only give to those in need at Christmastime. That’s the cliché, that’s the problem. After all, how could the solution of not being generous throughout the year be avoiding generosity this time of year? What we need is to be more generous, more often. It’s in this context of sacrifice, Christmas and gift-buying that makes things like the Advent Conspiracy worth considering. This year’s Advent/Christmas theme at our church is to “Give More”. I mention this not to promote our worship services nor impress you but more to invite you in to the idea of what it means to Give more of your presence this Christmas. Let’s give more of our time, with our physical being in a particular place, in our gift-giving, and in the ways that Jesus shows us to give – out of a heart of generosity, sacrifice and love. Thanks for reading, thanks for sharing, thanks for your public/private messages.